Finished another project last night and just had to let them sit over night to allow the glue to bond permanently. This was also a project from my ‘Get It Done’ list, number five. Again, apologies in advance for not taking more photos. I had most of this project done before I realized that I hadn’t taken more photos. They turned out pretty well, but I am thinking about doing it again with a different ball and if I do, I will take more photos then. I originally saw this idea on pinterest.com (how I love that site!). This seemed like another easy one to replicate. I kept my eyes open at my local craft stores, eventually locating paper mache balls, about 3 1/2 in diameter. I bought five just to make sure that one or two of them would turn out correctly. I then used a three quarters dowel and cut about 1/2 inch segments for the top piece. I also drilled a hole in the center to accommodate the fuse that would be added later. I glued the wooden disks to the top of the balls using E-6000 glue. These were set aside to dry. Next, I bought a six inch length of electrical wire and pulled it apart. That give me six inch segments of a pliable metal wire. I took two pieces and twisted them together to create the ‘fuse’. 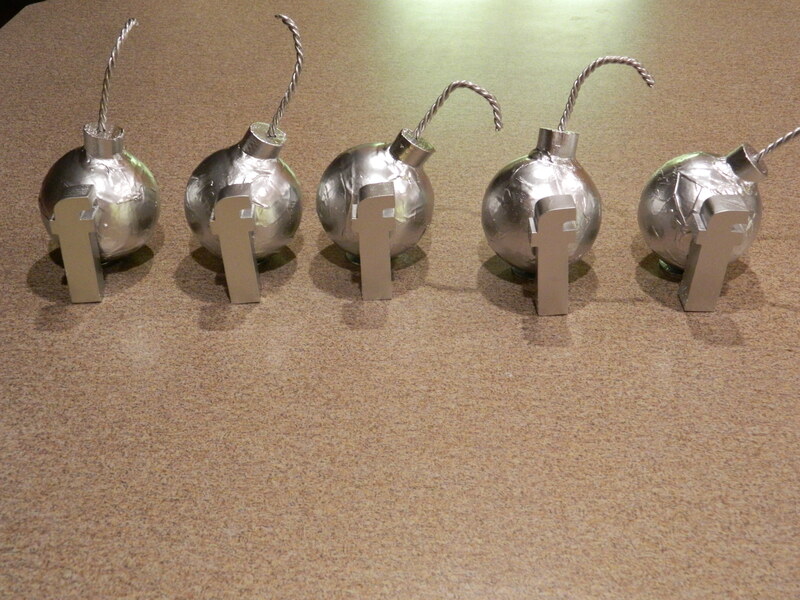 Once the ball assemblies were dry, I then primed them with high gloss white paint. This was easiest to do by setting them into empty small cans so that they didn’t roll around and would be held still while the paint dried. Because they were essentially paper, it took quite a few coats of paint. And of course after each coat dried, I had to turn them upside down to keep the coats of paint even. In the meantime, I searched for wood letters about the same height as the ball assemblies. I finally found them on eBay from a wonderful seller that I am sure I will use many more times. She is azwoodlady and she has some great customized wood letters and numbers in many sizes and reasonable prices. And quick shipping, too! Tell her I sent you! 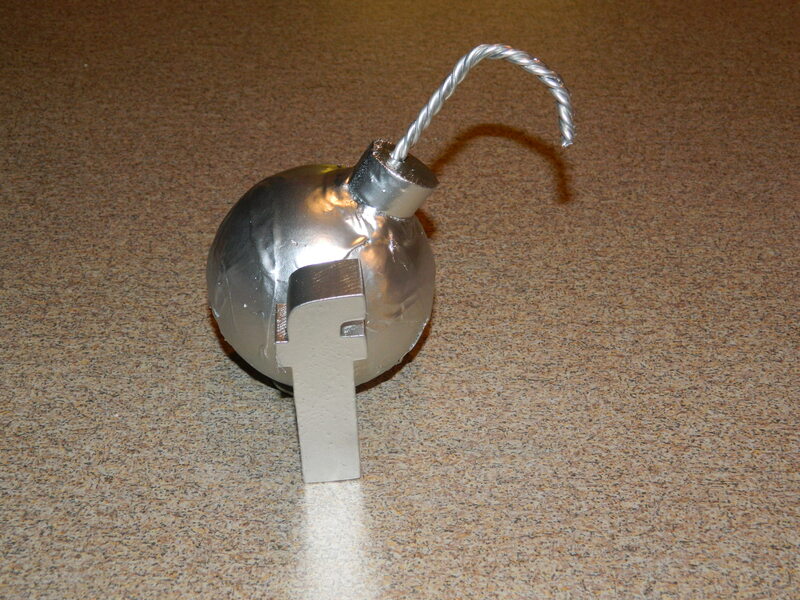 I purchased five 3″ letter “f’s” and primed them at the same time as the ball assemblies. This ensured that they had a consistent appearance. When I was satisifed that everything was primed evenly, I then spray painted everything with a bright silver metallic paint. When all the pieces had been allowed to completely dry, I then cut to a visually pleasing length a piece of the ‘fuse’ and slightly curved it and then threaded it into the top of the ball. It was a nice tight fit, so it didn’t require gluing. I repeated for all five. I then lined up one of the letters in front of a ball until I had the alignment correct and then marked on the letter where I needed to place the glue. I held it against the ball for about 30 seconds to keep it from moving and then set it back on the empty can to dry overnight. Again, repeated this process for the remaining four. After a couple of hours, I checked them and found that I the weight of the fuse was causing the ‘bomb’ to not stand up but roll over. I fixed this by glue a one inch washer to the bottom where the bomb would sit. Again it was returned to the can to dry. Be careful and don't drop an 'f-bomb'! The next morning, the f-bombs were completed! A couple of quick photos before I headed to work. 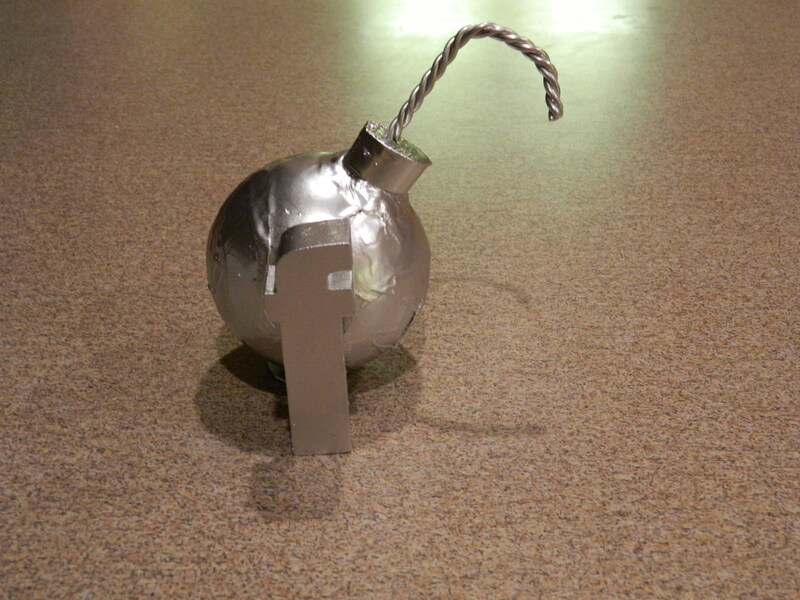 I have already given one to the first person I heard ‘drop an f-bomb’, my cube-neighbor where I work. It elicited quite a laugh! I can say that it was quite a hit with the folks I work with. I hope that you enjoyed this little craft and if you decide to make one (or more) of these, I’d love to see your results. Obviously, a big Mac fan (my first Mac was the first Mac) and mother to the most awesome kid in the world. A techno-junkie and self-proclaimed geek... I love anything and everything relating to computers. Addicted to collecting Pyrex! Also love making things and figuring out how to make or adapt existing stuff into something new! Always ready to try something new!